As you're browsing around our website you may notice an increasing number of pink products, with names ending in "for Her" or "for Women". It's a trend that's been gaining traction over the last couple of years, and it's being spearheaded by the two big manufacturers, ResMed and Philips Respironics. These manufacturers know that In the United States, an estimated 2% to 5% of women suffer from obstructive sleep apnea. That means that up to about 5 million women have sleep apnea in the United States. That's a significant percentage of the estimated 20 million Americans thought to suffer from sleep apnea. As a man I have to admit that it seemed a little silly at first. For a manufacturer to offer the exact same product in pink. But then I thought about it in reverse. What if MY only options for CPAP equipment, or clothes, or snow skis, or anything else for that matter, were PINK. I can assure you that pink definitely doesn't fit my style, so that would really be a travesty. I quickly came to realize that the idea wasn't silly at all. There's an emotional component that's critical to compliance with CPAP therapy. All too often I've talked with CPAP users on the phone who have had a pretty negative attitude toward their therapy. Nothing works. They feel terrible. The CPAP machine is too noisy. The CPAP mask hurts their nose. They've tried every single CPAP mask on the market to no avail. They're on the brink of giving up. And then a few minutes after that depressing conversation, I'll talk to a 10-year CPAP user who's thrilled with her CPAP equipment and appreciates the fact that the CPAP equipment is literally saving her life. What's the difference there? It's obvious that in a lot of cases, the difference is simply in attitude. We've all heard the phrase "mind over matter". Many of us have lived that phrase. Sometimes it's possible. Sometimes it's not. So, how can attitudes be changed for the better? Well, I know if I were buying skis for, say, $500 and my only choice was pink, I don't think I'd have a great attitude about the whole proposition. I'd be thinking that perhaps I'm getting into the wrong sport, or that I'm never going to find a good instructor who is familiar with teaching men to ski, or that the skis weren't designed for me, so that they probably won't work well for me. Attitudes - emotional responses - can be changed with colors. Seems simple and almost silly, but it's an important concept, and the two big CPAP equipment manufacturers have figured it out. Just like the ski manufacturers, and the car manufacturers and just about everybody else figured it out decades ago. Of course, I'm not intending to mean that a simple change of color will fix all the problems that CPAP users have to deal with every night. But that change of color represents more than a style change. It represents a commitment from the CPAP manufacturers to women. It can remind a woman that she's not alone, and that CPAP machines and CPAP masks were, indeed, created with women in mind. It can remind a woman that there are literally millions of other women coping with and treating obstructive sleep apnea every single night. That color change might just lead to a little tweak in a CPAP user's outlook, or to an improvement in a CPAP user's attitude, that might make a difference between success and failure. What's really surprising to me now that I've thought about it for a while isn't that CPAP manufacturers are offering products designed specifically to match a woman's style, but that they didn't offer these same women-specific products twenty years earlier. Note that besides a difference in color, most CPAP masks designed for women will offer a smaller size cushion. For example, The Swift FX for Her includes extra small, small and medium nasal pillows, while the standard Swift FX includes small, medium and large nasal pillows. 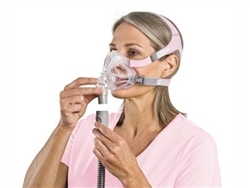 Here's the current list of CPAP equipment designed specifically for women. We're sure this list will grow over the coming months, and so we've decided to make new women-specific sub-categories for CPAP masks and CPAP machines on our website. So there you have it. A man's take on CPAP equipment designed specifically for women. I'd really like to hear your thoughts on the matter, especially if you're a woman. Visit the American Sleep Apnea Association for information on AWAKE support groups for CPAP users. AWAKE is an acronym for Alert, Well, and Keeping Energetic, and these support groups all over the United States can help new CPAP users benefit from the knowledge and advice of experienced CPAP users. Even if an equipment color change helps you treat your sleep apnea, your local AWAKE group can provide ongoing support and can help ensure ongoing compliance.